Pen and ink, 28.2 x 41.3; wm? ; a small piece of the upper left corner missing, and two small pieces missing from the bottom center and the lower right; creased down the center. There is a word (? ; “Ro ed”?) written in pencil in the sky at the upper left; inscribed in pencil on the mount: 69. Kusenberg (see below) reported that on the verso appear some numbers under which is written: de Roux fiorentino. Herbet, 1902, 81 (1969, 233), as Rosso’s original drawing. Kusenberg, 1931, 148, no. 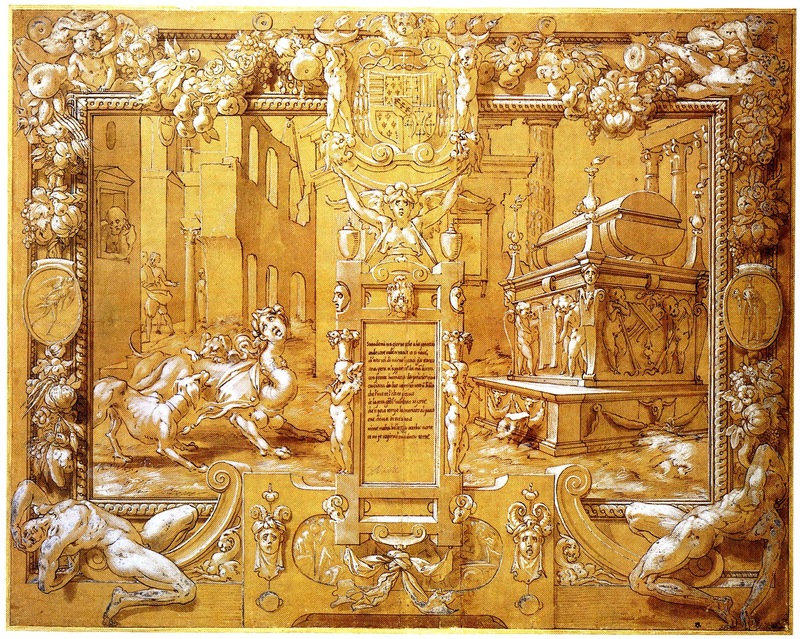 9, as a copy of Rosso’s fresco in the Gallery of Francis I and the model for Fantuzzi’s etching [E.76, on which, see D.65]. Béguin and Pressouyre, 1972, 138, as resembling Rosso’s fresco, but simplified. Carroll, 1987, 278, 281, n. 3, under no. 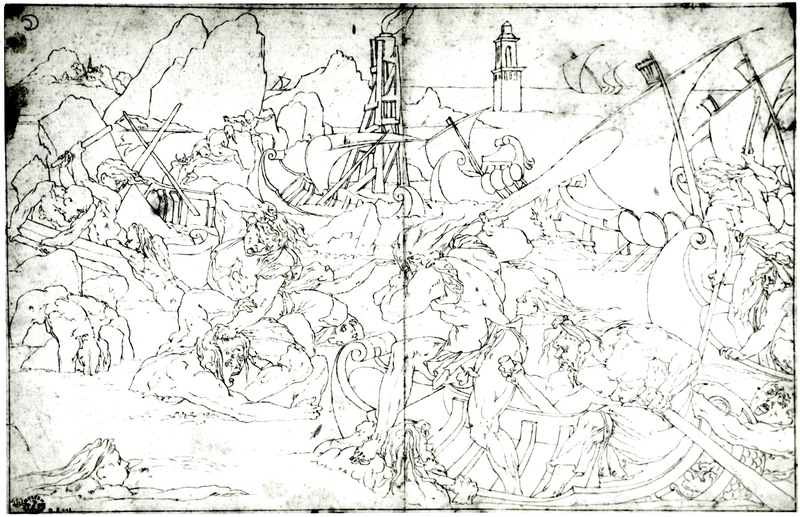 88, as a copy of a lost drawing by Rosso. 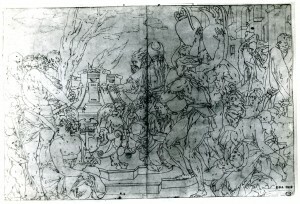 The composition of this drawing is identical to Rosso’s Scene of Sacrifice in the Gallery of Francis I (Fig.P.22, VII N a) except in a few details. 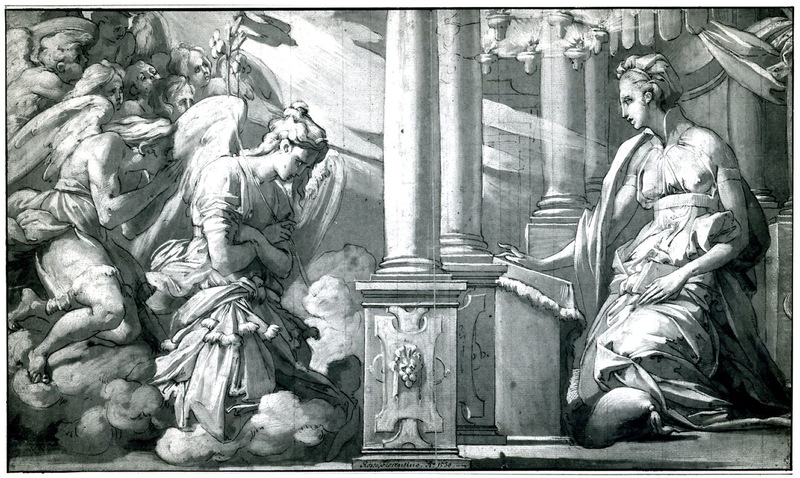 At the base of the altar the fresco shows griffens instead of harpies; there is no fleur-de-lis on the oval medallion above the leg of the altar in the drawing; some of the babies have hair in the painting, while all are bald in the drawing; the entablatures at the upper right have moldings in the fresco that are absent from the drawing; the flames are tongue-like in the drawing, while in the fresco they are more painterly and have smoke; and there is a passage of drapery down the back of the foremost vase-bearer in the drawing that is not found in the painting. These differences make clear that the drawing was not copied from the fresco. 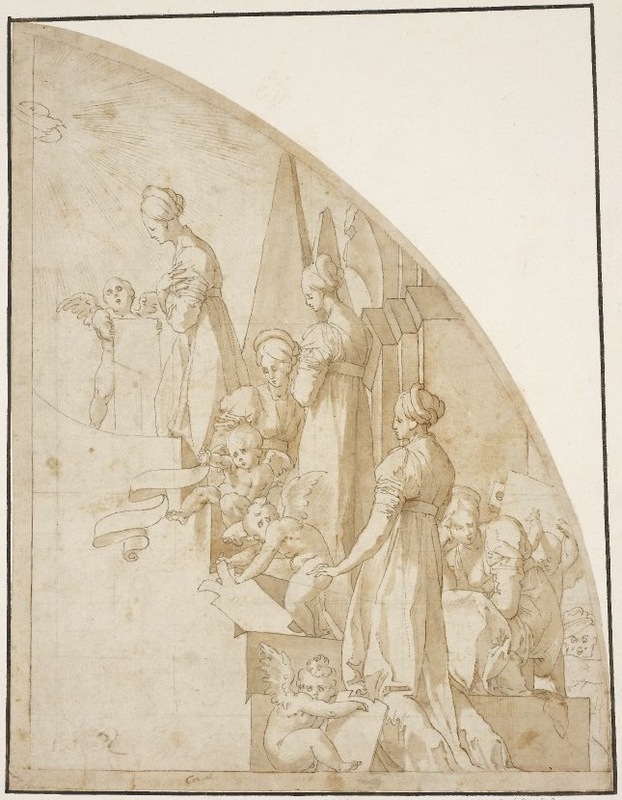 Such details as the simplified entablatures, found in Rosso’s Allegory of the Virgin as the Ark of the Covenant (Fig.D.33Aa), and the bald babies, which appear also in his Design for an Altar (Fig.D.38a), indicate, as does the penmanship of the drawing, that it is a copy of a lost drawing by Rosso. That penmanship, which is very precise but too unmodulated to be Rosso’s own, is of the kind that appears in his Albertina Annunciation (Fig.D.43a) and in his Petrarch drawing at Christ Church (Fig.D.47a), and must copy very closely that of Rosso’s lost drawing. However, there is no autograph pen drawing by Rosso without shading. 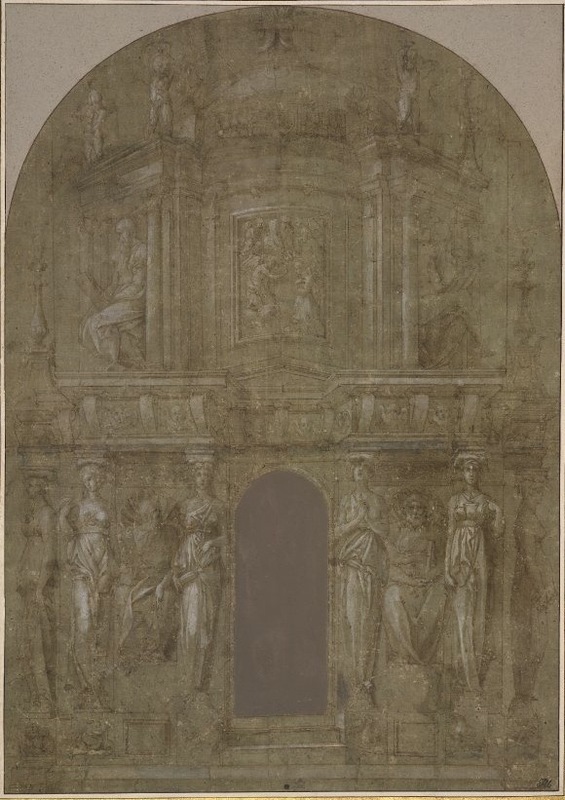 It is, therefore, likely that the lost original drawing had washes, but it may also have had a dark ground and white highlights, like the Annunciation and Petrarch drawings, and the lost drawing, known from faithful copies, of Rosso’s study for the early version of the Scene of Sacrifice (Fig.D.50B). 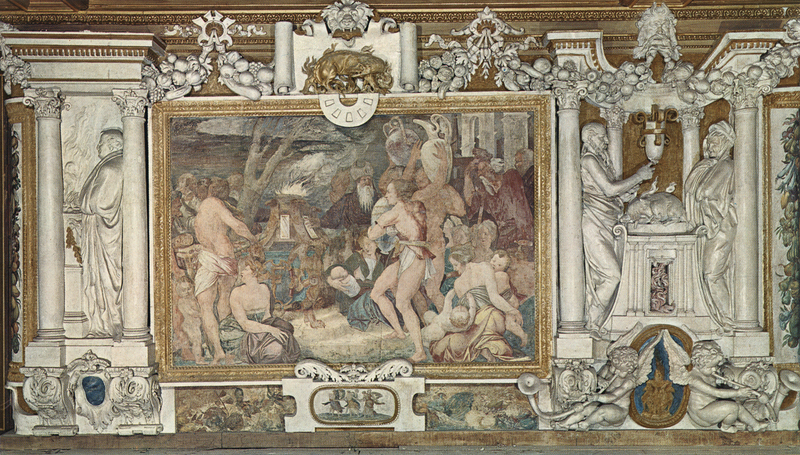 As Rosso’s fresco in the gallery was designed between August and November 1536 (see P.22), contemporary with the Death of Adonis, the lost drawing must also have been done in this period. 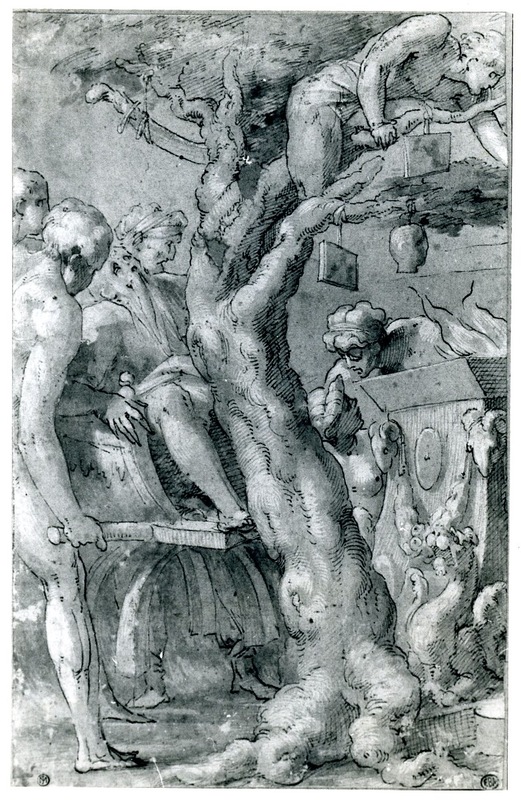 The changes in the fresco would first have appeared in other drawings, of which D.65 is one. 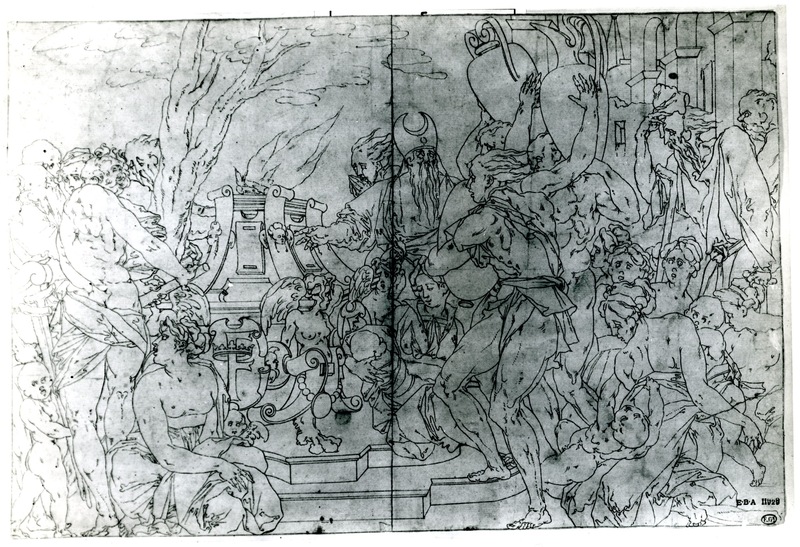 This copy seems to be by the same hand as the copy of a lost drawing for the Revenge of Nauplius (Fig.D.59).